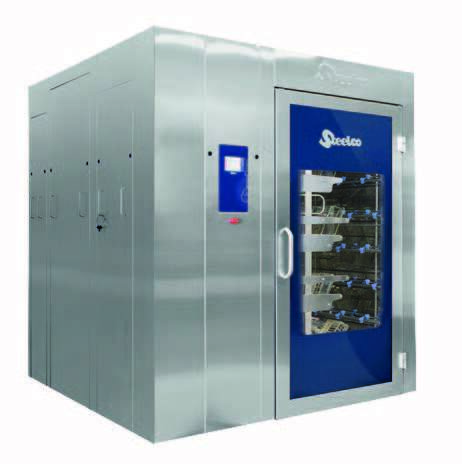 The AC 7500 series cage and rack washer is a heavy duty, large capacity, hydro-spray, steam heated washer specifically designed to support the throughput of medium and large size facilities. The compact size and frontal access for servicing allow it to be installed in premises of reduced dimensions. 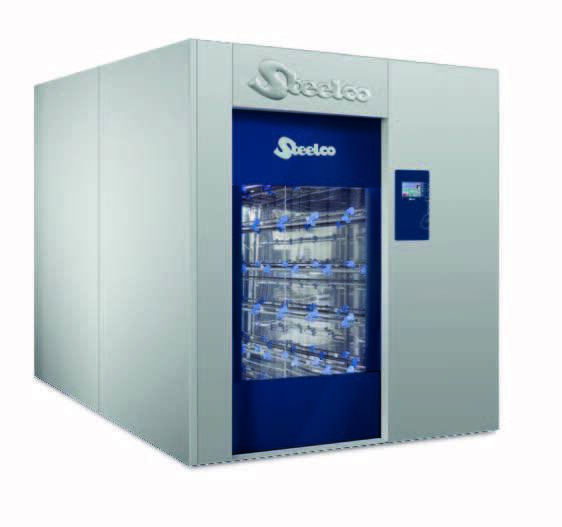 The AC 7500 is standard equipped with two pre heating water tanks and two dosage units. 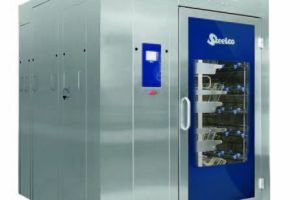 This results in greater flexibility in cycle development and may include a pre-wash followed by a standard wash, or a sequence of different chemicals wash phases. The rinse circuit is completely separate from the wash circuit. 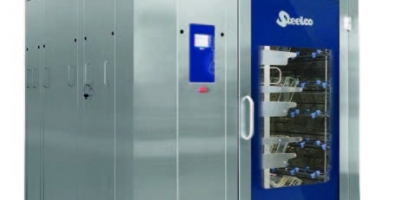 Multiple oscillating spray arms guarantee a complete and continuous coverage of the load and the chamber providing excellent wash results in a short cycle time. 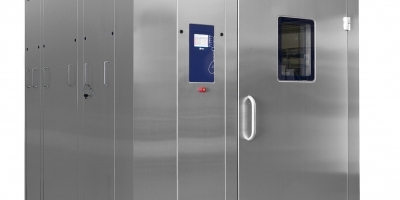 The AC 7500 cage and rack washer features swing doors, operator multi-language touch screen HMI with auto diagnostic checking that constantly monitors and displays current status. The external body is in Scotch Bright finished Ra<40in (Ra<1.2m) stainless steel panels AISI 304 (thickness 1.2 mm). 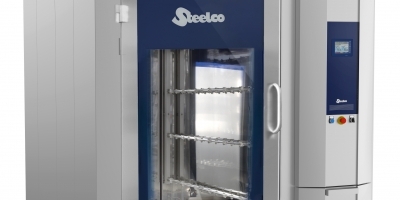 – Stainless steel AISI 316L (DIN 1.4404) washing chamber side, stainless steel AISI 304 external side with inspection windows or full HST glass door. – Fully insulated to reduce heat loss and noise. – Interlocked doors (double door pass through version). 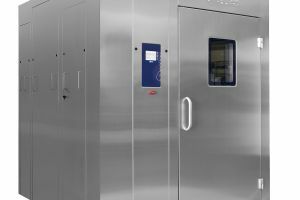 – The AC 7500 access doors are equipped with integral inflatable gaskets in order to grant the tightness of the chamber in SPF barrier facilities as well as during the decontamination and sanitization cycles. – Operator safety is guaranteed by a man on board safety cable and a door gasket deflating valve. – The chamber is made entirely of mirrored finished Ra<30in (Ra<0.8m) stainless steel AISI 316L (DIN 1.4404) (thickness 2 mm). – Designed and constructed with smooth edges and corners thus removing areas where dirt can accumulate and allow bacterial growth. High performance melamine insulation 15mm (0.6”) thick guards against heat loss and reduces noise level. The loading floor is made of AISI 316 stainless steel and composed by sections that can be easily lifted to reach the bottom of the washing chamber for cleaning and filter maintenance. • The loading floor is equipped with adjustable rail guides to match the client cart and racks castor lay out. • User friendly hook to remove the floor panels for maintenance. Separated washing and rinsing circuits with spray nozzles to grant full washing chamber/load coverage. • Washing spray nozzles are installed on multiple horizontally mounted oscillating pipes on the two sides of the wash chamber and on multiple fixed pipes on the ceiling of the wash chamber. • Rinsing spray nozzles are installed on multiple horizontally mounted oscillating pipes on the two sides of the wash chamber. • Easily disassembled spraying nozzles for cleaning and maintenance. Process control of the wash cycle to ensure result repeatability.The pressure switch is used to keep under control the wash pump performances. The AC 7500 is equipped with a multi filtration system made up of 3 different levels; the first two filter stages in the sump and the final one (inline self cleaning filter) within the water recirculation circuit. • Filtration system to capture residue during the re-circulation of the wash water and protect recirculation pump from debris with pre filter and flush self cleaning filter. 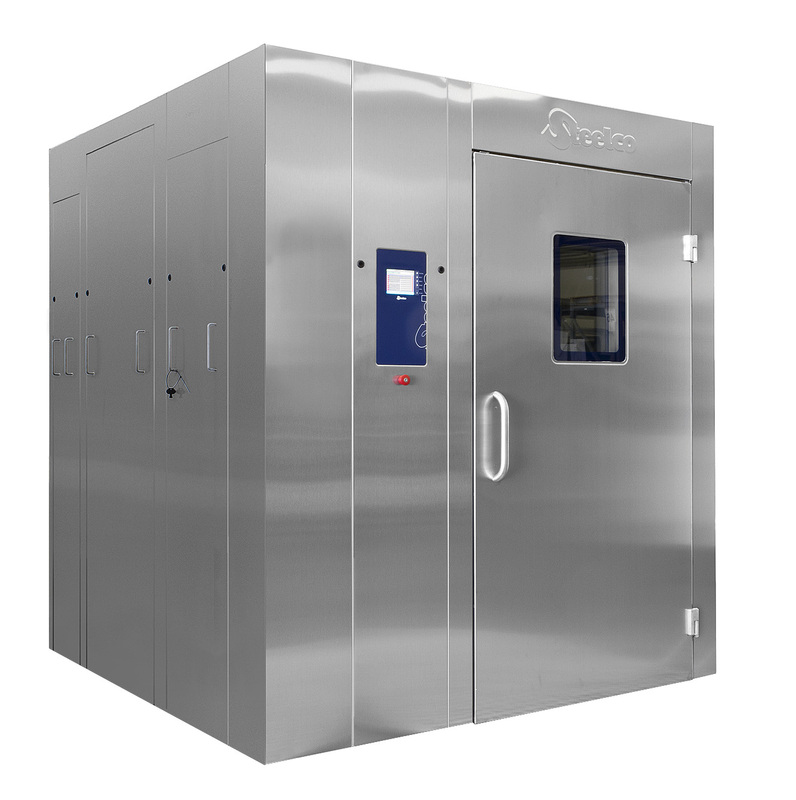 The AC 7500 is standard equipped with two chemical dosage units to dispense chemical products. • Two (2) peristaltic pumps provide precise addition of liquid chemical agents. • Flow meters for accurate volumetric dosing. • Chemical product level check with minimum level warning/alarm. 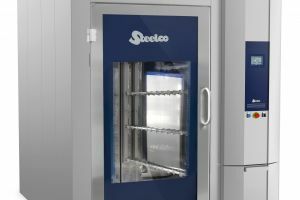 – Operator multi-language touch screens (one for each side of the cabinet), Industrial PLC, safety devices are provided as a standard with the AC 7500 cage and rack washer. PLC microprocessor with auto diagnosis function for real time monitoring of the machine installed devices: water level sensors, pressure transducers, temperature probes. – The panel is equipped with a USB and Ethernet connection for the back-up and restore of the software. Can be also used for data sorting on request. The user creates unique programs to meet their specified needs. Listed are various phases that can be programmed and repeated into a variety of combinations. • Pre-Wash – User is able to define the length and temperature of pre-wash. 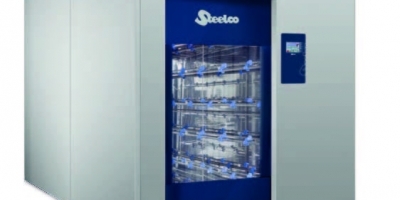 Cold or warm pre wash (above 35°C (95°F)) can be configured accordingly to the items to be reprocessed. 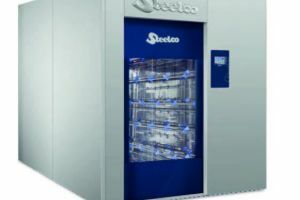 • Wash – User is able to define the length of the wash cycle, detergent dosing and dosing temperature, temperature of the water (up to 93°C (200°F). • Neutralization – User is able to select the length of the rinse, the presence and the amount of neutralizer, temperature of the rinse (up to 93°C (200°F). • Final Rinse – User can define the length of the final rinse, temperature of the water (up to 93°C (200°F) presence and amount of rinse aid. The machine has been designed to be disassembled into sections for entry into existing building. 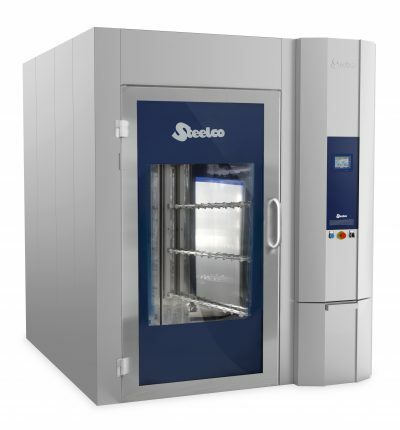 – The AC 7500 recirculates the water during the wash phases and saves the water used for the final rinse to refresh and warm up the water in the pre heating wash tanks. – The only water consumed in a single cycle is the one used for the final rinse, thus resulting in an extraordinary savings in terms of water, energy and chemical consumption.